I tried to make this library as portable as possible therefore, in order to use this library, you only need to define couple of GPIO functions in your project and that’s it! Moreover, this library supports auto-retransmission and auto-ack features of the nrf24L01+ modules. nrf24L01+ modules can be found at incredibly cheap prices these days. Seeed and iTead sell those modules at around 3 USD but in ebay or aliexpress they can be found at around 1 USD. Issue reports and comments for the library are welcome! This entry was posted on Wednesday, May 1st, 2013 at 11:00 am	and is filed under library. You can follow any responses to this entry through the RSS 2.0 feed. You can skip to the end and leave a response. Pinging is currently not allowed. Ah, Brilliant! 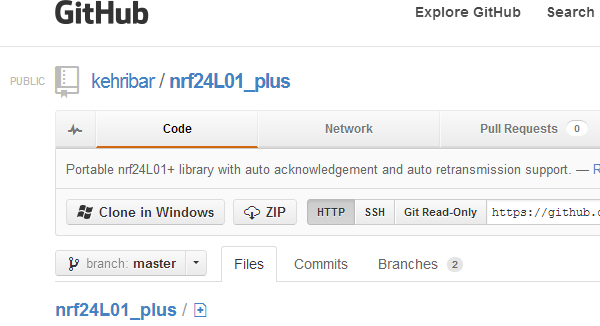 I’ve had “Write NRF24L01 Library” on my to-do list for ages! i was just worried how i will manage to write all the library subroutines my self and you found life to me :p with wireless thanks….alot will check and let you know..
Hi! first of all thank you so much for this great library! you did a great job and sure if we meet sometime I’ll pay you a coffee and a beer as well. I would like to ask you one problem I’m facing when testing the receiving code. In my case, instead of using the serial port to output the values transmited, I’ve just attached a simple 16×2 LCD and I’m showing the values there. The problem is that once the receiver has received one packet it no longer receives anything else. I’ve detected that if I don’t keep displaying the values on the LCD then it works fine. However this is not a good solution as I can not see the values on the receiver side. Is it because of some kind of problem with timing. I’m suspecting that if the receiver nrf24l01 loses a packet then it stops receiving anything else. Please if you could give me a hand here I’d really appreciate you. i’m working with NRF24l01 by avr. i m new to atmel stduio 6 i want to interface nRF24L01 to Atmel SAMD10 ic. please help me for library as i try to complie avr based library i wont worked for me.